Sacred Caravan consists of two loving couples who sing and play music that glorifies the transcendent joy of the Universe thru Kirtan. Teed Rockwell, a student of Hindustani Masters Ustad Ali Akbar Khan and Ustad Shahid Parvez, is the only person in the world who plays Indian Music on his customized Touchstyle Veena (AKA Chapman Stick). Diana Stork is also a student of Ali Akbar Kahn. She can be heard on dozens of albums, including “Harpestry” on Universal Records, and “Sacred Light” on the At Peace Music label. She has been a frequent performer at Grace Cathedral in San Francisco for their labyrinth walks. 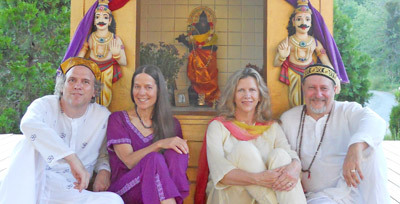 Gangadhar Gerhard has traveled throughout India researching and singing Kirtan vocal music, and has performed with Jai Uttal, Bhagavan Das, and Allen Ginsberg. Rhonda Gerhard is a yoga nidra teacher and psychotherapist. Together they create a sound which adds a new dimension to Kirtan Singing and Sacred Instrumental Music.